Becoming the best in the world has it’s consequences. 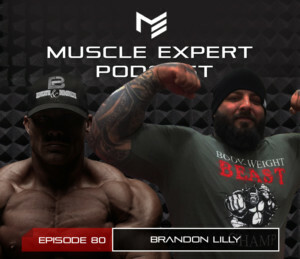 Brandon Lilly is a retired world class powerlifter and a major reason for the raw movement in the sport. He is the creator of the cube method and currently trains many world class lifters. Hear how the journey out of powerlifting has been one of Brandon’s biggest challenges and greatest triumphs. From surgeries to depression Lilly has dealt with it all and has great life lessons to share in this conversational episode between two legends. 2:40- How collapsing on stage changed the trajectory of Brandon’s life. 6:30- The decent. How coming down the mountain can be just as hard as ascending it. 9:35- His new drug. How social media gave Brandon a high even when he was at his low. 12:00 The Champion Mindset. Laser focus and drive is what is necessary to be a champion but what does it do to those around you. 15:40- How a childhood incident made Brandon give two middle fingers to the world and why it took him years to change that mentality. 17:05- How Brandon got into powerlifting and his advice to aspiring powerlifters. 21:05- Stop and smell the roses; the journey is what makes the destination. 23:55- Living without labels. The discussion turns to how labeling yourself can put you in a self-fulfilling box. 29:30- Escape vs. enlightenment- Brandon’s experimentation with drugs and how changing his end goal changed everything. 32:00- The Hero’s Dose- How Brandon used a high dose of mushrooms for self-discovery and to overcome depression. 34:20- Brandon’s transition from geared powerlifting to raw and how it changed the sport. 41:40- The ego can cause you to do crazy things. Including turning your mentor into your nemesis. 45:10-Ben and Brandon discuss how to use your haters for personal growth. 48:10- Why gratitude is so important and completely changes your perspective. 50:30- What Brandon is doing now that he has retired from powerlifting and his extreme practices to rehab his knees. 57:00- Wrap Up. Ben and Brandon talk life lessons and must hear take aways.